I just read yesterday that the North By Northwest Blu-ray is supposed to have a marvelous transfer and upgrade/purchase is recoemmended practically for everyone. Now I am wondering if I should get it despite the fact that my DVD version of it is still unwatched. 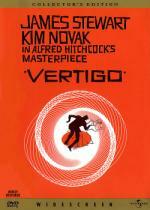 I just edited my review for Vertigo because I decided it's rubbish. Of course, that comment could not be more false. No, I remembered an easter egg that's really worth seeing, so I added the instructions. You swine. I'd convinced myself it wouldn't be worth upgrading and then you come along, with your la-di-da, "ooh, the rumours", "best blu-ray ever", blah, blah. Do you have any idea of what you've done? Do you? One way ticket to Double-Dip City please. I'm seriously considering it. Play have it for £12, released on 16th. I seriously doubt the other marathon runners will have caught up by then! In fact, is there anyone else left? Have I worn you all out? I plan to watch Vertigo, North by Northwest and Psycho for the November marathon. I have set the next two deadlines to end of November. Feel free to go even further if you like. No you have not worn me out..I'm just still horribly behind. I will try to catch up this month, though once some work stuff starts up, I'll have to see..it is irritating how work interferes with my movie watching and review writing. When Scotty falls in obsessive love with Madeleine, she's playing a part to entrap him. So while it's overwrought, she's pretending to be overcome by Carolotta's spirit and I can excuse it. The scenes with Judy are disturbing, so I can't work out which side you found weak. The final point I don't even know how to question it: "not the greatest storyline"? What was wrong with it? An audacious and brilliant narrative that took the conventions of Film Noir and subverted them. By the way, I'm not trying to pick on you, it's just lately I can't help feeling we just do random reviews when we used to talk about them a bit more. So I want to be a bit picky and thrash things out more! Ponderously slow (130mins) - the set-up was dragged out, with the whole trailing by Scottie of Madeleine too repetitive. IMO this could have put a less determined viewer off. Appalling romantic scenes - rewatch their first kiss, as she 'melts' in his arms at the touch of his lips - come on!!! it's the worst part of older films, they used to bump and grind in them days same as we do now. And the 'swooning' when he puts his arms round her The later depiction of his romantic obsession is not what I was referring to. Not the greatest storyline - it isn't? I don't know about film noir or it's conventions, I just know what i like and don't. It's a good storyline, it isn't great. And 2 other points for me that stop this being a masterpiece and what I didn't mention before; what a disappointing ending, you cannot dispute that! And WTF happened to Midge? First time I saw it, I wondered where it was going, but since then it works. If you're interested in such things, it's actually very intricate and there are no wasted moments. It is supposed to repetitive, so this can't be a fault. But the first part as I said is tough to pin down. You can't deny it is ruthlessly efficient. It goes out of it's way to be dark ("Noir"), yet you can't argue with the fact that Scotty is right back where he started, except now without the pesky fear of heights. That's proper film narrative, that! Midge? Again ruthlessly efficient. The story wasn't about her -she never alters- and she is inconsequential. You might appreciate the alternate ending. Check out the instructions in my review for finding it. Certainly I do auto-adjust my brain to account for the age of a film, such as things like melodrama, but in this case I think it's both conventional and cancels itself out. Nope, definitely his masterpiece! Suggested further viewing: Chinatown and Double Indemnity. More typical Noirs, and more modern in Chinatown. You may enjoy it more and after watching Vertigo, some of the elements should stick out like a sore thumb, which they are supposed to do. Sorry, I just couldn't resist. At least you got the knowledge now that you won't be double-dipping alone. Well, my decision is was made, I'll double-dipped. Here is the third stellar review, this time at TheDigitalbits. Heck, the video is rated higher than that of the recent G.I. Joe (which you find at the same link)!